Las Vegas music festival mass shooting. 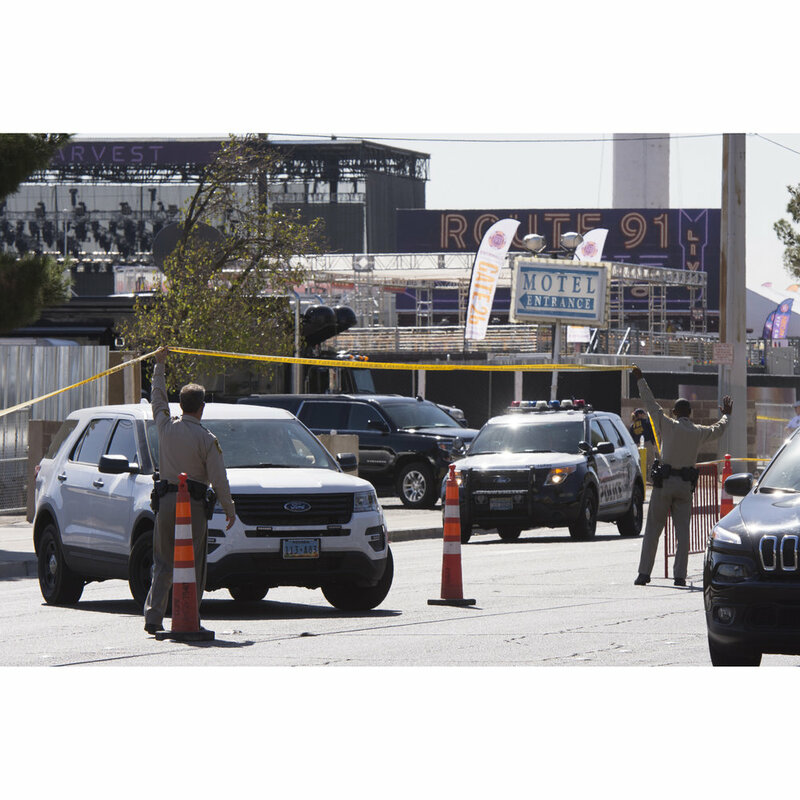 Photos from the Route 91 Harvest Country Music Festival mass shooting in Las Vegas. The first three images are festival coverage from 2015 and the rest show the aftermath of the Oct. 1 shooting. Festival goers arrive at Route 91 Harvest Country Music Festival at MGM Resorts Village in Las Vegas Friday, Oct. 2, 2015. Route 91 Harvest Country Music Festival audience members watch the show at MGM Resorts Village in Las Vegas Friday, Oct. 2, 2015. Members of the audience dance during Ruthie Collins' performance at the Next from Nashville stage at Route 91 Harvest Country Music Festival at MGM Resorts Village in Las Vegas Friday, Oct. 2, 2015. Las Vegas Police work at the Route 91 Harvest Country Music Festival mass shooting site on the Strip in Las Vegas, Nev., Oct. 5, 2017. Broken windows used as a perch by gunman Stephen Paddock during the Route 91 Harvest Country Music Festival mass shooting are seen at Mandalay Bay hotel-casino in Las Vegas, Nev., Oct. 5, 2017. A makeshift memorial for the victims of the Route 91 Harvest Country Music Festival mass shooting is seen next to the crime scene on the Strip in Las Vegas, Nev., Oct. 5, 2017. A makeshift memorial for the victims of the Route 91 Harvest Country Music Festival mass shooting is seen on the Strip in Las Vegas, Nev., Oct. 5, 2017. On Oct. 5, 2017, at the East Las Vegas Community Center, Lisa Bailey, third from left, and other attendees listen as Nev. Sen. Pat Spearman, D-North Las Vegas, speaks during a vigil to commemorate the victims of the Route 91 Harvest Country Music Festival mass shooting. On Oct. 6, 2017, in downtown Las Vegas, Nev., volunteers work on the Las Vegas Community Healing Garden to commemorate the victims of the Route 91 Harvest Country Music Festival mass shooting. Visitors walk the newly opened Las Vegas Community Healing Garden to commemorate the victims of the Route 91 Harvest Country Music Festival mass shooting in downtown Las Vegas, Nev., Oct. 7, 2017. 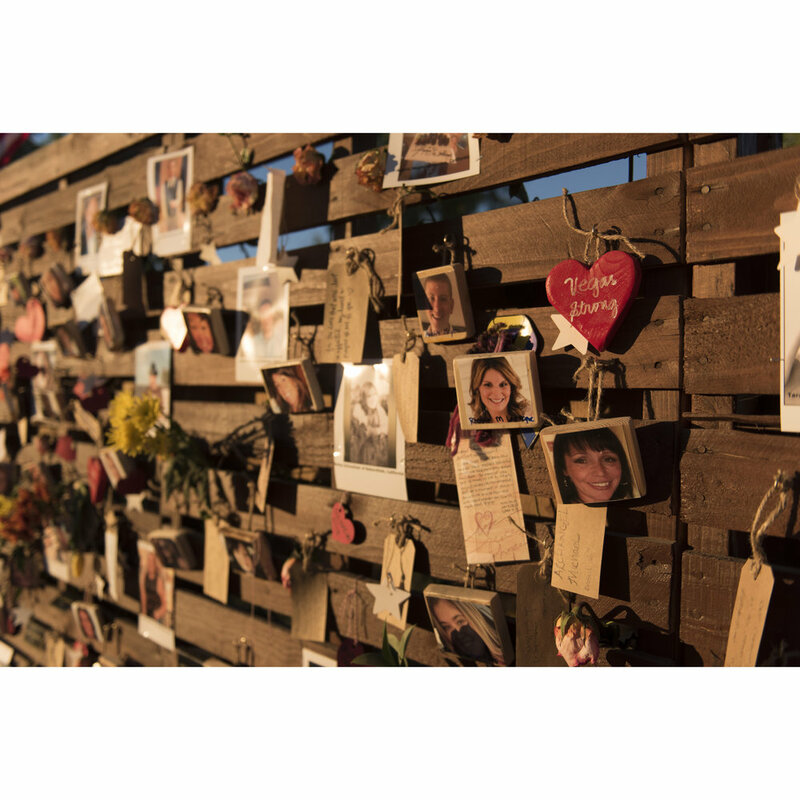 The victims of the Route 91 Harvest Country Music Festival mass shooting are commemorated on the remembrance wall of the newly opened Las Vegas Community Healing Garden in downtown Las Vegas, Nev., Oct. 7, 2017.